James Baird passed away this past February unexpectedly after serving only a relatively short time as President of the Washington DC Stake. He was much loved, not just by family and friends but throughout our Stake and in the community beyond our faith. Below is part of a talk given by James Baird to his congregation when he was their bishop. As I prepared for the native tree planting to honor James, I had the text of this talk in mind. "One of my weaknesses that I’m aware of, is the fact that I am basically a telestial man. I love this earth. I like to work in the dirt. I love to watch the sunset on warm beaches. I love the taste of a fresh toasted tomato sandwich with mayo, sea salt, and fresh-ground pepper. I love to stand in cold streams and try to outsmart the fish who have a brain the size of a pea. I love all of the physical sensations that my physical body experiences, like the way my stomach feels when you go over a rise too fast in a car. I love so much of what comes into my ears, my mouth, my nose, on my skin. I have spent much of my life pursuing these pleasures, and trying to provide them for others. I justify all this by reading in Genesis that God created all this for the use and benefit of man, to gladden his eye and lighten his heart. Certainly He wants us to appreciate His beautiful creations. While not a complete epicurean, I am well aware of how much I love all that God has placed for me on this earth, and have trouble imagining that it is any better up there. Maybe there are a few of you who feel this way too. Then why should we work to get off this planet that God placed us on and created for our use and happiness? How can we enjoy all this beauty and still... try to rise above it all?" James is no longer a telestial man. Knowing how marvelous our natural world is, we can have confidence and complete faith that our loving Heavenly Father has prepared for James joys and experiences beyond our ability to imagine. I feel much as James, that God wants us to appreciate His beautiful creations. To do that we need to spend time in nature, learn more about and show greater care for Creation. We can enjoy all this beauty and in the process, we are often inspired "to rise above it all". Some of the stalwart volunteers who arrived two hours early to get our trees planted before a major storm hit. We were joined by about 30 volunteers with others who certainly would have been there except for the storm and change in schedule. Photos from Merikay Smith and Chalice Leaman. Thanks to everyone who came to help honor James Baird by planting an area of native redbud trees. 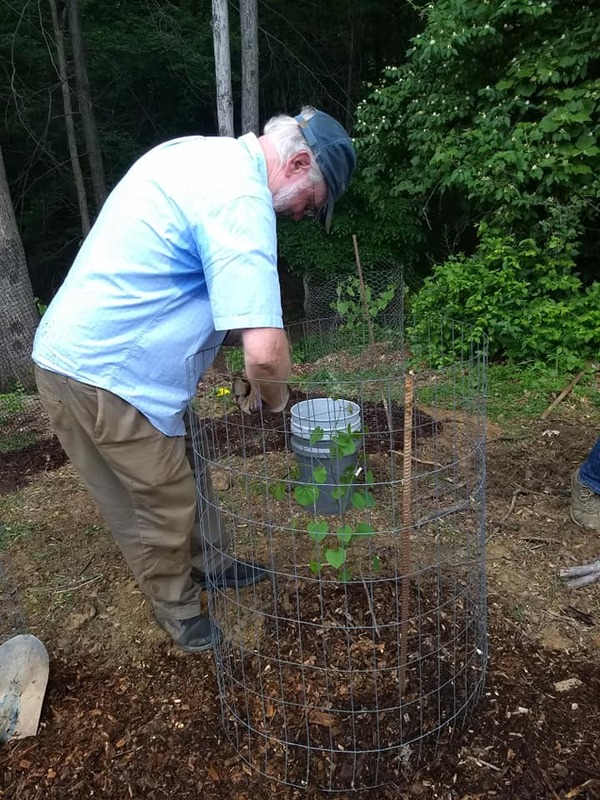 If you missed this activity, join us in the fall as we add native ground cover plants, remove more invasive plants, and continue to make this an area of the DC Stake Center where people will remember James Baird.